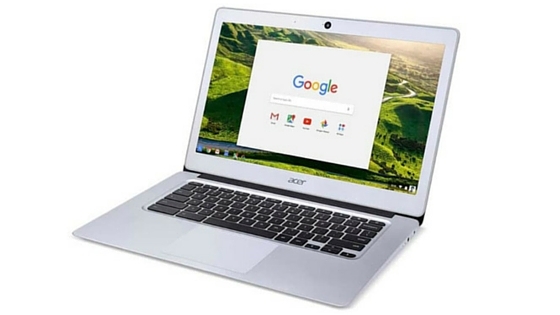 Acer has expanded its Chromebook series of laptops with the launch of Acer Chromebook 14. It is unique from its predecessors because it features a 14-inch display, and an all-aluminum chassis. The USP of this device is the 14-hour battery life, as claimed by the manufacturer (more on this later). The device comes with a 720p webcam with 1280x720 resolution, HD audio and video recording. It has dual stereo speakers and an integrated digital microphone. The IPS display is 20% larger than 11-inch models. It comes in full HD (1920 x 1080) and HD (1366x768) resolutions. Wide viewing angles up to 170 degrees are supported. The display boasts of ComfyView low-reflection and anti-glare properties, which help in reducing strain to the eyes. The 14-hour battery life is advertised for the models with HD display. Buy the one with FHD, and you end up getting around 12-hour battery juice (which is still impressive). The Acer Chromebook 14 runs on Intel Celeron processor (dual-core or quad-core), paired with either 2 GB or 4 GB dual-channel LPDDR3 SDRAM. The internal storage is either 16 GB or 32 GB, which is supported by 100 GB free storage on Google Drive. The laptop weighs 1.55 kg, and measures 0.67 inches (17 mm) at its thickest point. With an all-metal body and such thinness, the device appears to be a Macbook Air clone. On the connectivity front, it comes with two USB 3.1 ports and an HDMI port. Usual options including WiFi and Bluetooth are available. Acer Chromebook 14 will be available next month onwards. Price for the premium model with FHD display, 32 GB storage and 4 GB RAM is $300.